John R. Gregovski was Married with 2 Children. 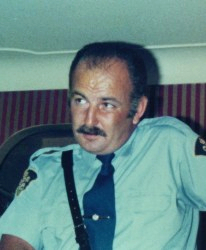 PC Gregovski was killed January 4, 1989 when a tractor trailer hit his cruiser while he was assisting a disabled van in the westbound lanes of the QEW at the base of the Garden City Skyway Bridge. The cruiser was parked behind the disabled van in the right hand lane of the 3 lane highway with all roof lights activated. The driver of the disabled van was in the rear seat of the cruiser when the tractor trailer hit the cruiser pushing it into the disabled van and further up the Skyway Bridge. Both the officer and the driver of the disabled van were killed.